A new café which lives and breathes all things bike will celebrate their grand opening in Dumfries with an all-day party, bike demos and a walkthrough of their new premises on the Whitesands. ‘The Frothy Bike Co’ are opening their doors for the first time on Saturday 13th April at 8 am and will be inviting the public into their brand-new shop to enjoy music, food and drinks and to view their brand new shop in the heart of Dumfries. After living in the French Alps for several years, Ross returned to his hometown of Dumfries to bring back a taste of his time in the hub of downhill biking. 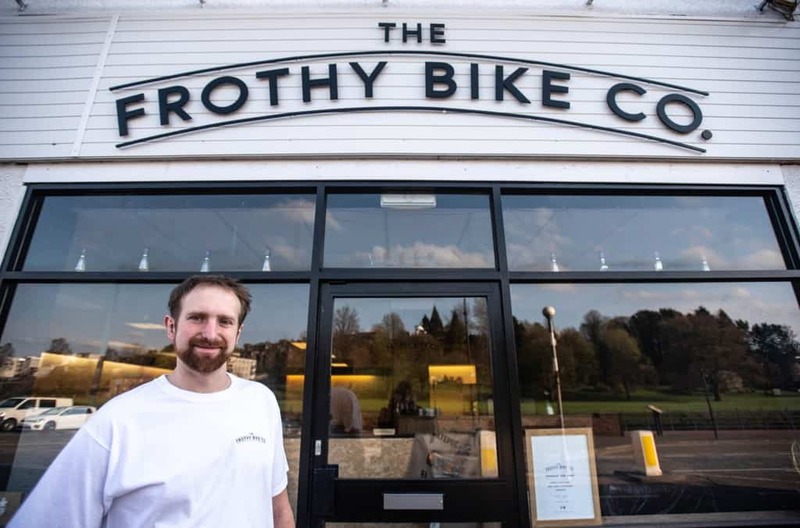 Ross’ idea for ‘The Frothy Bike Co’ stemmed from a passion for the region’s landscapes and world-class cycling – and a determination to bring something new to the town centre which combined these passions with a café culture. The warm and welcoming café provides indulgent, freshly made healthy food which will keep you fueled all day. They endeavour to deliver the best for their customers with their excellent coffee from John Watt Coffee & Teas and their highly trained baristas. The Frothy Bike Shop stocks a large range and variety of bikes, including brands like Cervelo, Kinesis, Nukeproof and Ragley. As well as this, they will stock a wide selection of components, accessories and clothing to match. Their friendly, knowledgeable staff are on hand to provide expert advice and guide buyers on their decisions. The shop also boasts an impressive, fully kitted out mechanics workshop where all the staff are cytech trained mechanics with many years of experience. From small repairs to full services – your bike is guaranteed to be in good hands! They also offer bespoke bike builds, creating you your own one-off, fully customised bike. The Frothy Bike Co will open its doors for the first time on Saturday 13th April at 8 am and everyone is welcome. Thereafter it will be open 7 days a week from 8 am – 6 pm.